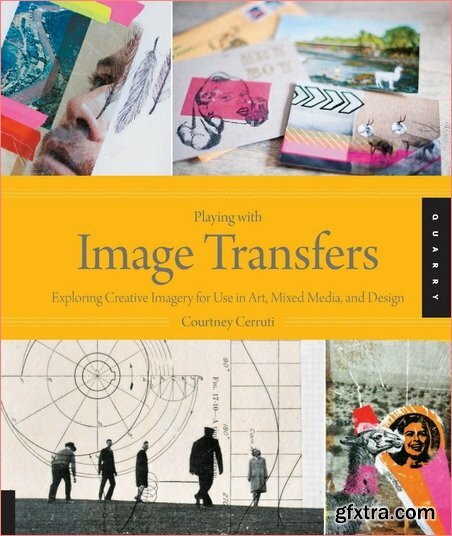 Courtney Cerruti, "Playing with Image Transfers: Exploring Creative Imagery for Use in Art, Mixed Media, and Design"
Whatever art you practice, chances are you’re going to come across image transfer techniques. These valuable techniques allow you to reproduce a unique image from any source and apply it to a myriad of surfaces. The options are endless! Playing with Image Transfers is a beautiful and helpful resource that will teach you the four image transfer methods: Packing Tape, Solvent, Medium, and Acrylic transfers, while highlighting basic methods and offering projects across a range of interests and applications. You’ll learn how to make beautiful items, including gift boxes, albums, sketchbook covers, wall art, accordion books, and much more. Once you’ve mastered the techniques, you’ll also explore multiple surfaces as a base for transferring – wood, fabric, paper, canvas, and book forms. A beautiful gallery will show the use of image transfers in a wide variety of high-end artistic works to get your creative juices flowing. The “Considerations” in each chapter offer suggestions on how a single project can be expanded or further adapted if you’re looking to challenge yourself past the basics. By the time you finish this informative book, you’ll be well-equipped to use your own images in your creative work.